On the first morning I spent in Warsaw, I set out with Doppler to go and explore the city. We had a nice ride through the old town, down to the Vistula river then back up and through the capital. After lunch, whilst cycling through a little road close to the central station we heard some music. As we progressed down the road we came across what looked like a nice little parc from where the music seemed to be coming from. 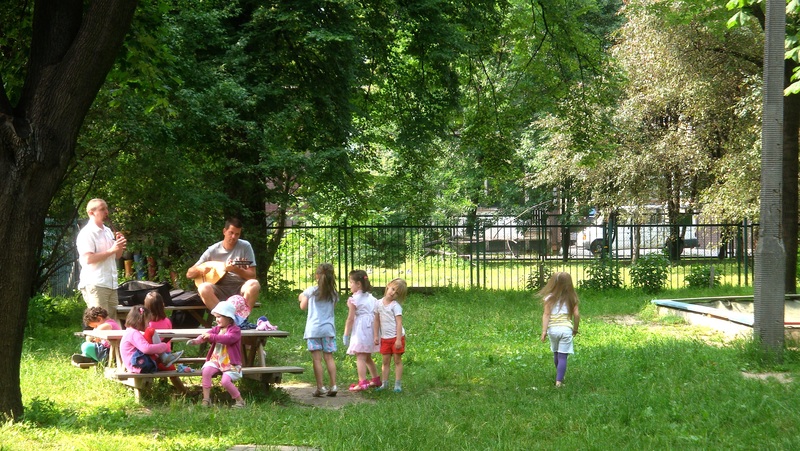 We approached and found the parc to be fenced off but from there we could see two musicians and children dancing and playing around them. So I stayed by the fence listening to the music. Turned out that what looked like a parc was actually part of a kindergarden which explained why the women looking after the children kept looking at me in a strange way… Anyways, the musicians finished playing, packed their stuff up and as they were walking out I went up to talk to them. The teachers, relieved to see I was after the musicians, finally smiled at me as I asked the duo if they wanted to record something for the project. They did. They are from Hungary and were on their way to a small province in Russia to perform at a folk festival. They play traditional Hungarian dance music and had come into Warsaw for a few hours in between two flight just to visit. They’d been looking for a parc to sit down and play and, just like me, had thought the kindergarden was one. Luckily they were spontaneously invited to play for the children. The kids loved it and were jumping up and down fascinated by what they were hearing! They performed their pieces on a Cobza (Koboz in Hungarian) and several different forms of Kavals and overtone flutes. Several centuries ago the Cobza was the poor mans luth and had spread from the Turkish empire across to central Europe. By the 20th century it had almost entirely disappeared and was only surviving in poor countries like Romania. With the folk revival of the 70s, it resurfaced through dance house music. Traditional Polish singing from the sewer to the bedroom. In Warsaw I was staying with Anastazja Bernad and her sister Zosia. I arrived by train and Anastazja picked me up from the station with her bike. She showed another cyclist I met on the train the way out of the station and then we took of into the busy street of the capital of Poland. The cycle ride that followed my arrival felt fantastically crazy: we raced down big streets lit up by neons and headlights, zig zagging through cars on roads not designed for bicycles – Anastazja and a friend in front, then me trying to keep up with my heavy bags and excitement. We finally got to her appartement not far from the football stadium where a couples of days later I was to see a horde of fans march back up into the center. Upon arrival I didn’t realise that Anastazja sang or that she lived with her sister who’s also a singer – I was staying with her as she was friend of a friend. I discovered her beautiful and powerful voice in some sort of tunnel used for draining overflow from the city’s sewers into the Vistula river (the longest river in Poland flowing through several major cities). You might be wandering what we were doing in such an unappealing place? 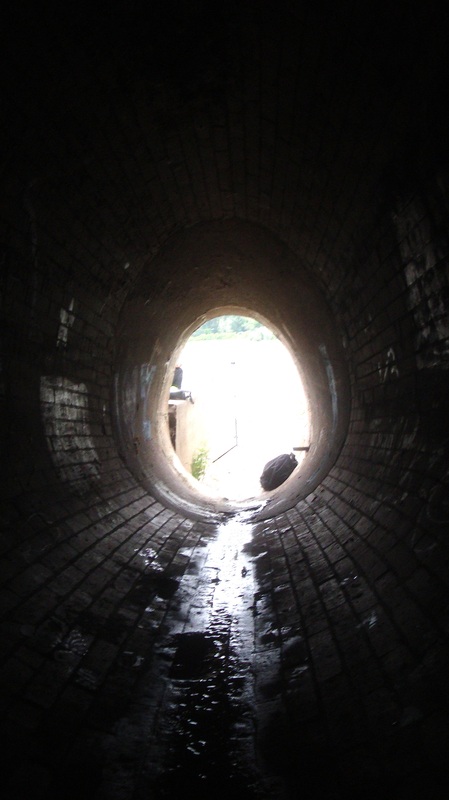 The answer is quite obvious – we were looking for interesting acoustic spaces! and this tunnel most certainly was one! It had a really cool complex reverb. It started with the usual diffuse reverb as the sound bounced around and, down the oval shaped structure, then it seemed to hit something in the far distance creating a distinct echo a few seconds after the initial impulse. Finally, the vibrations seemed to travel back up through the walls creating some weird wooshy sound! very weird. Also, this tunnel has a particular historical background as it was used by the Polish resistance during the Warsaw uprise in 1944-1945. It allowed them to access the old town from the river banks! – Ktòrztam po kumorze is about a girl going to get married and is talking to the voice of her dead mother. The girl asks for her mother’s blessing but the mother’s voice answers that she can’t give it to her because of three locks imprisoning her: the Wood from the coffin, the Sand/Earth and the green Grass. Pause-none and call for artists! It’s now been nearly 3 months I’ve been on the road. I must admit I’m getting a bit tired. I’m realising how much I cherish having people I feel close to. Although I’m meeting amazing people everyday, I don’t have time to develop strong relationships with them. I feel like the project is loosing a bit of momentum and, thus, I am too.. (or maybe it’s the other way round…) However, I’m sure this is only ephemere! So I wouldn’t mind a bit of help. I’m heading towards Israel going through Krakow or Wroclaw, then probably Prague, Vienna and Slovenia/Croatia. Once I get to Croatia I’m confident my knee will have fully recovered – it’s already feeling a lot better. Thus, I’m planning to cycle from then on down to Greece then Istambul (I’m might cheat a last time and cross Greece by train – I’ve been told it’s not a particularly nice cycle). If you want to help, please share the project with your friends and if you or them know anyone in those abouts, invite them to get in contact with me. In the meantime, in Poznan (pause-none… 🙂 ) I met a crazy pianist called Monika. 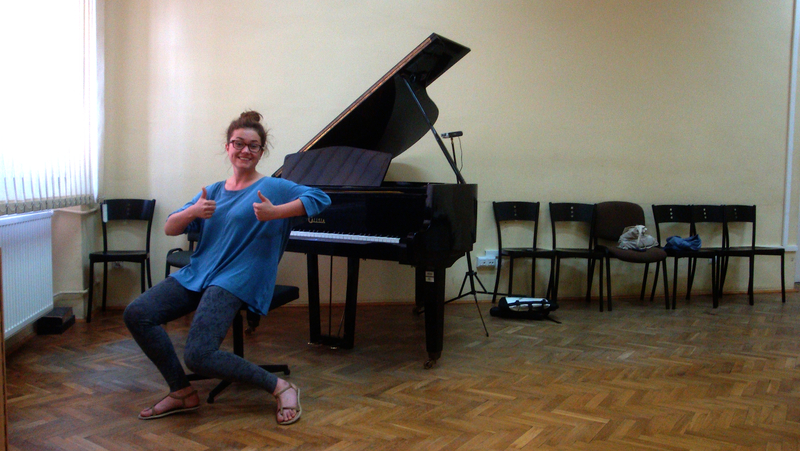 She is studying music and more specifically rhythm in Poznan’s Akademia Muzyczna (Academy of music!). Sharing a similar sense of humour the recording session turned into an awkward not-quite-understanding-each-other’s-sarcasm-in-our-respective-language session. The room we were recording in was in her university and we had it booked for an hour. The hour went past very quickly and was mostly just improvised bits and pieces! It was brief but fun and here are the recordings! From what I understood, in polish you say ‘eggs’ if someone makes a joke, probably mainly for bad jokes – thus, the titles. Experimenting in Berlin is like hanging between two flying saucers. Finally! Last Berlin post and I promise I’ve got some cool stuff coming from Poland – be patient! Berlin is a flat city with an incredibly rich and tumultuous 20th century history. What I find amazing about the capital is that its history is still very present and visible. At the end of WW2, just like many other German cities, Berlin was in ruins. Not knowing what to do with all the rumble it was decided to pile it all up creating 6 hills around the city disrupting its flatness. 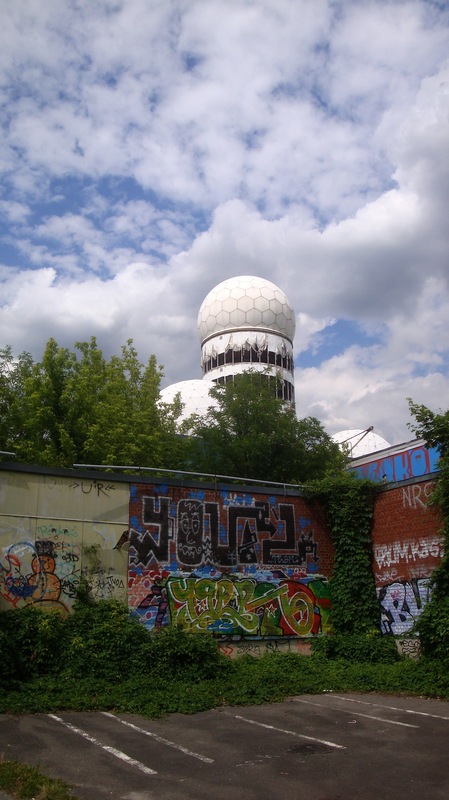 Then as the Cold War developed, the American teamed up with the English and built a huge observation post on top of one of these hills: Teufelsberg. The station supported satellite dishes that where sheltered in four big golf-ball-like structures. Aaron, a sound engineer from Berlin, took us all the way up to the highest golf ball. The structure being empty and only composed of very reflective material you get a ridiculous acoustic phenomena – endless echoes. As the structure is round, all the reflections are redirected to the center of the dome, if you stand there for more than a few minutes I think you’d go mad! You’re madness might be cured by appreciating the spectacular view you have over the Berlin and all its surrounding. We went there as party of five: Jack (a friend from London), Aaron, Christina (my wonderful Berlin) host, Stephan (Saxophonist I randomly met in Berlin) and me (me). We took loads of instruments and played around with the space pretty much all day. Unfortunately, I was so excited by the space I spent most of the time playing rather than recording, so most of what we did isn’t recorded and I made a few misjudgements of mic placement – sorry… Anyways, we recorded a selection of Jack’s songs and covers with improvised sketchy accompaniment. The most exciting thing we did was stand all around the space and singing different notes while individually searching for a resonant pitch. When a point of resonance is found we slowly start increasingly the volume. 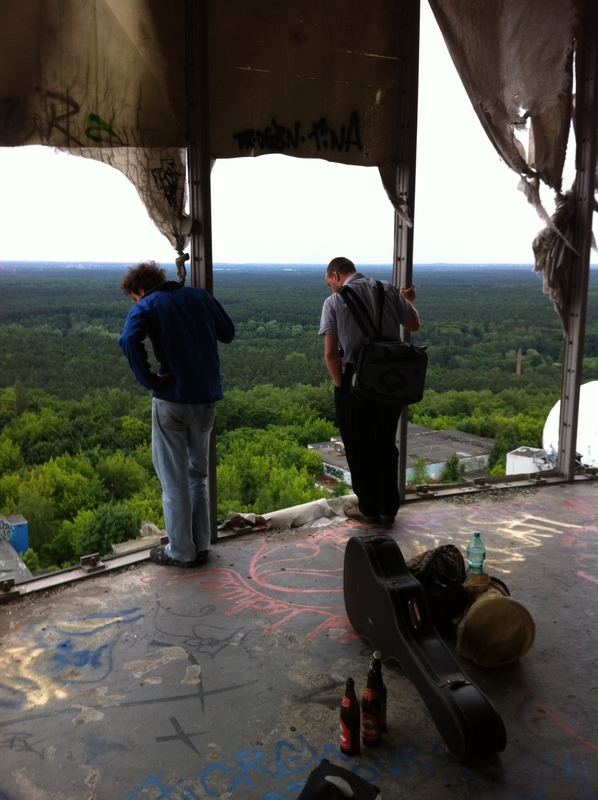 The corresponding recording is Teufelsberg by Impromptu collective. That’s it for Berlin! Unless I find those Gypsy Jazz recordings! Poetry on a bag and Winter music as summer arrives. During the first few days after my arrival in the capital, I met up with Julia de Boor for a chat and some nice Chai Tea. 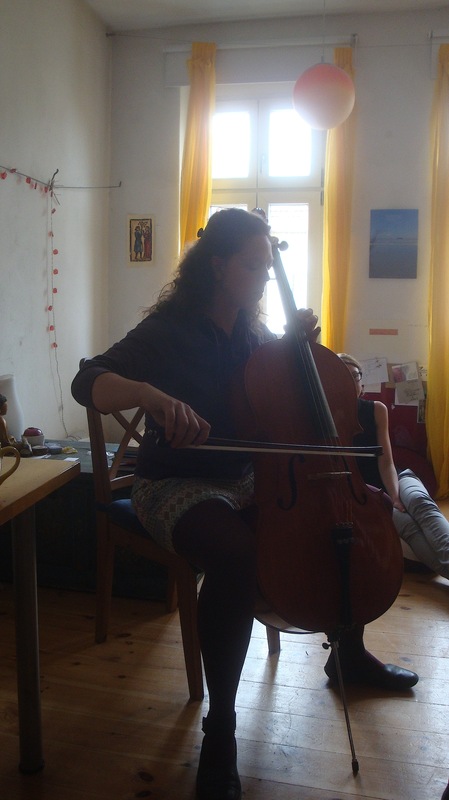 Julia does musical theatre where she improvises as an actress and as a cellist, generally, with and, for children. In parallel, she writes poetry. She has written a five chapter book of her poetry called Funkenspuren (which translates as ‘Tracks of sparks’). Also, once a year she gets together with a photographer to make beautiful calendars combining his photos and her words; she writes a poem for each month of the year inspired by the selected picture. 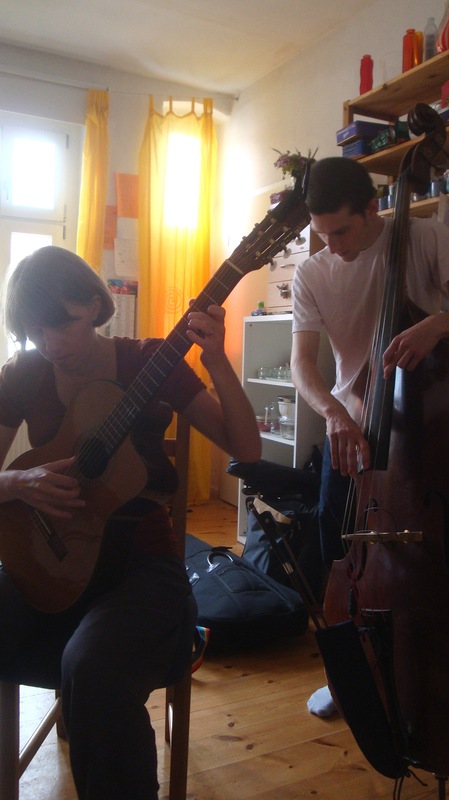 So a few days after our meeting we arranged to meet at her house to record some of her poetry and then record a band in which she plays cello: The Gosia Winter Band. Mein Weg ( My way ) – The longing for a relationship and the feeling of not wanting to be alone anymore. Nah am Abhang (Close to a cliff) – Sad and desperate, a man looks down from the edge of a cliff only to reinforce his sorrow. It’s only when he looks up to the horizon that he sees the beauty of the immensity of what lies before him and sees light. Flut/Ebbe (High-tide/Low-tide) – Originally two separate poems but it made sense to perform them together one after the other. The first relates the feeling of wrath and the second its after feeling of emptiness. Wege (Ways) – Love poem. Ach Bitte (Hey! please) – This poem is written on 15000 paper bags that a shop hands out to clients and is about begging a child to share his courage and dreams. Die Kleinen tone (A small sound) – Written after waking up early in the Alps and is about all the small sounds that we don’t hear if we don’t pay attention to them. Yesterday, I arrived in Poznan after a fairly eventful cycle ride! The sun is shinning and I don’t feel like being in front of a computer! So I’ll update the website sometime in the next couple of days – I’ve loads of interesting stuff to share! Near to where I am staying in Berlin in the Neukölln area there is a market every Tuesday and Friday. There is loads of nice a food and at the end of it is a little balcony overhanging over a river. There you’ll usually find loads of performers busking or just looking to entertain. Last Tuesday, there was a particularly good selection of them. While I was enjoying some nice african food with Jack Durtnall who came to join me for few days, a trio of Argentinians (guitar, bass, cajon and all three singing) took the front stage (more like the left side of the balcony on the side of the road and not of the river). They started to play some of their reggae songs from a band they have in Argentina adapted to a trio format. Slowly people couldn’t resist getting up and dancing and Jack couldn’t resist running home, taking his sax out and jamming along! Once they finished their set, we went and asked them if they wanted to take part in the project. They accepted. We took them to where we were staying whilst our amazing host made them maté (the Argentinean national drink). We set up in a narrow corridor and they started playing. 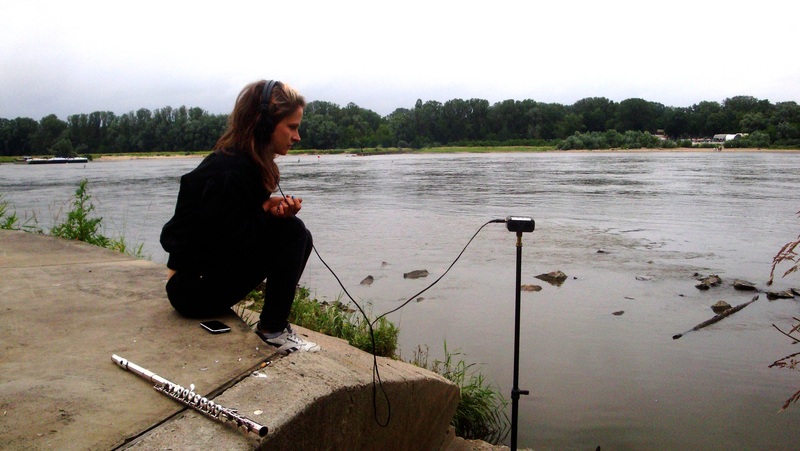 Jack joined in a few of the recordings and so did I with my flute (it’s my sister’s actually…)! It was absolutely great! We had a great time. So if you’re looking for things to do in Germany, they’ll be there for a month and have a few gigs. Go and see them! They’re awesome! ps: there’s a rumor that they’ll be playing on the same market this coming Friday and probably in Maurepark on Sunday?